In a groundbreaking longitudinal study, researches studied seven similar social housing neighbourhoods in Ireland to determine what factors affected their liveability. 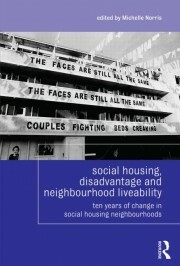 In this collection of essays, the same researchers return to these neighbourhoods ten years later to see what’s changed. Are these neighbourhoods now more liveable or leaveable? Social Housing, Disadvantage and Neighbourhood Liveability examines the major national and local developments that externally affected these neighbourhoods: the Celtic tiger boom, area-based interventions, and reforms in social housing management. Additionally, the book examines changes in the culture of social housing through studies of crime within social housing, changes in public service delivery, and media reporting on social housing. Social Housing, Disadvantage and Neighbourhood Liveability offers a new body of data valuable to researchers in Ireland and abroad on how to create more equitable and liveable social housing.